A SERIES of thin-film, single-value chip resistors, featuring excellent high-frequency response and low shunt capacitance for exceptional performance in hybrid assemblies and microwave and RF circuits, has been announced by Vishay Intertechnology, represented by Braemac . 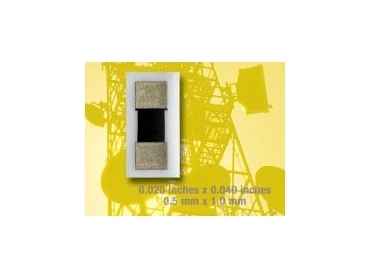 In addition to dimensions as small as 0.25mm by 0.5mm, the Vishay Electro-Films Microwave Resistor series (MIB, MIC, MID, MIF) features a strip-line design that enables the design of higher-performance end products by providing a solution specifically optimised for microwave and RF requirements. Typical applications for new devices include amplifiers, oscillators, attenuators, couplers, and filters. Devices in the Microwave Resistor series feature a microwave resistance range of 20Ω to 1kΩ and an overall resistance range to 20kΩ. Tight tolerance values down to ±1.0% are available, with TCR values from ±25 ppm/°C to ±200 ppm/°C. These compact resistor chips provide a stray capacitance of less than 0.2 pF. Vishay Electro-Films Microwave Resistor series devices feature a maximum operating voltage of 100V, a dielectric breakdown voltage of 400V, and 25mW to 200mW maximum dc power ratings at +70°C. The high-stability thin-film resistor element is tantalum nitride, which is self-passivating and moisture resistant. These resistors have an operating temperature range of -55°C to +125°C. The MIB, MIC, MID, and MIF microwave resistor chips are built with an alumina substrate and gold terminations. They can be attached with conductive epoxy, ribbon-bonded, or wire-bonded. Other Vishay devices that are suitable for use with the Microwave Resistor series include wire-bondable capacitor chips, inductor chips, user-trim resistor chips, and TMR multi-value microwave products.